Generally, sari made with one type of fabric with one main color on it with various other colors printed on it and that’s how typical sari was designed. Different styles embroidery work, floral work and other many types of work applied on it to get into the final form. So far in the historical, traditional and typical style design is ongoing, although designers have changed few things like color matching, border, Pallu style and much more. The new revolution of designing is invented because of immense demand from modern and fashionista girls and women. This prototype was invented in south India’s known fashion hub Hyderabad that was designed by utilizing two different type of fabric with totally different type of weaving and feel. These pieces of Clothes Bridge with each other in distinguish way that the top (front) part and lower part look completely different. Furthermore, South India fashion half saris attached with separate Zardoshi work, embroidery work, Pearl (Moti) work on each part and finally the masterpiece design get ready to give the phenomenal appearance. In today’s fashion, this design has many different types and concepts. The baseline of this design is typical lehenga style and the lower piece of cloth resembles a lehenga because the fabric is exactly same as lehenga. For example chiffon with net or silk fabrics are mostly used to make it, moreover, it is designed with Zardoshi work, Moti work, patchwork and much more. The other piece of fabric attached to match with Choli so as not to have high embroidered lower piece but in some design, the silk fabric is used to make the top part. 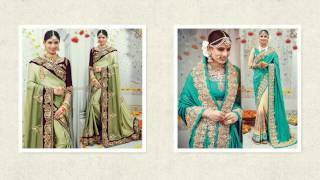 The main specialty of these type of sari is you can buy perfect lehenga choli look in reasonable price and you can also drape it properly to get the perfect fitting. 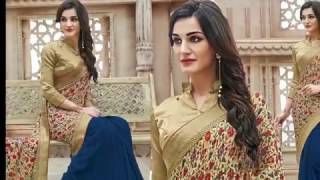 These half sari blouse patterns are very popular as bridal wears and also loved by Bollywood actress. You can see designer half sari designs for Wedding Reception in b town movies as well as award functions and parties too. This sari’s lower part is designed with golden strip so at the time of making this sari the lower part is separately embossed with handwork and paneled strip work. Once it is completed, it is attached to the other portion of fabric followed with the lower part design and that’s how this whole concept gets the final touch. It is designed with a hard effort by designers in compare to other types of saris designs. The cost, however being higher, we bet you would get the stunning look through these type of half saris style, young girls will always enjoy wearing it in receptions parties. Simple prints on georgette fabric are the base line of this whole style. Two separately printed patterns clothes attached together to make beautiful half sari. It has no embroidery work which is why it is quite light in wearing and the cost is not as high as the other style of design and hence it does not go that heavy on the pockets. In today’s fashion, this daily wear gives a versatile look in the professional life of working women. This form is made using two type of fabrics or cutting style fabric crafted with two different styles of clothes in which the top part is attached to net style fabric or cutting style design and the lower part of chiffon or silk fabric. New designs of 2017 have added extra beauty to this attire. Moreover, this style of design can be worn in both ways if you want then you can make your lower part extra glamorous with net fabric at the bottom and also party wear half sari blouse designs back for attracting the bunch of boys. Various types of half saris patterns are popular with Lucknow style work, which add extra features to it. The USP of these designs is the price because when compared to the usual sari they look elegant and the pricing is comparatively same. Amalgamation of three different types of fabric with a different color is done to make this type of multi color design. It has not much embroidery work but very effective to wear in formal function because of its decent appearance. If someone wants to add, extra glamour than she should try different styles of half sari wearing styles with heavy embroidery worked blouse and make it look outstanding. 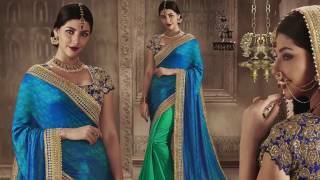 Enjoy designer half saris online shopping with price from any corner of the globe.